Have you seen this woman? I mean, have you seen her outside of that video where she whips a chair from the balcony of a condo building over the Gardiner Expressway and miraculously manages not to kill anyone? Toronto Police are appealing to the public for help in locating the person who spawned Monday’s biggest local news story with one very bad decision over the weekend. 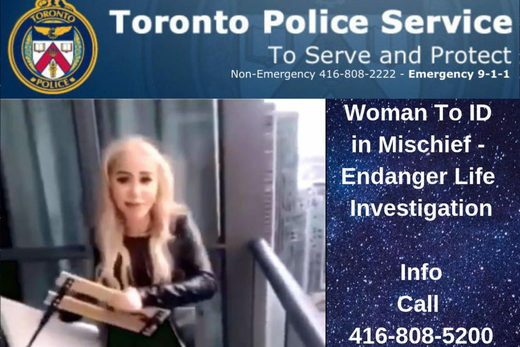 “Chair-toss-chick,” as I’ve taken to calling her, rose to the peak of Toronto internet fame on Monday morning after video footage surfaced of her throwing patio furniture from a high-rise onto fast-moving traffic below.